The Baby Z Adventures, Episode 2!, originally uploaded by M1khaela. She's not even two weeks old, so I'm told these aren't real smiles, but... my goodness how she's grown already! By seven days old, she was already 9 pounds... which is 10 ounces over her birth weight! No sewing going on at the moment (still trying to learn to live the sleep-deprived life) but I have been knitting some striped lacy baby socks, photos to be forthcoming. And those nursing/maternity sleep bras I sewed myself a while back have been super-handy. P.S. Thanks so much for all the congratulations, I was overwhelmed and so happy to get so much love for Baby Z! She's just soo cute! Enjoy her while you can, because they get so bag so fast. My DD, Suzanna, is 11 months old, but I swear she was born about 3 weeks ago. When I say it I feel like I am channeling the Big Bad Wolf...but it is meant to be endearing. She is simply precious. Too precious for words. Hi there! Just found your blog while "link hopping" and wanted to say congrats on your gorgeous baby girl. You have such a beautiful family. She looks very much like her daddy in the last picture. What a dimple! And orange is her color, isn't it? Oh the dimple! She's so gushingly cute. 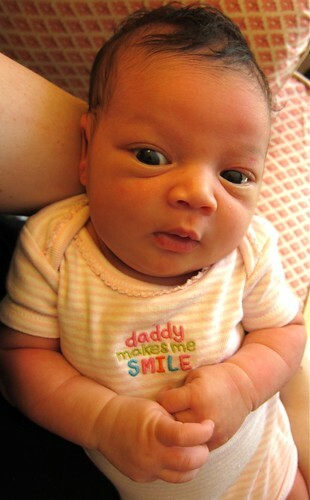 Aww, in that last picture she definitely has her daddy's eyes. 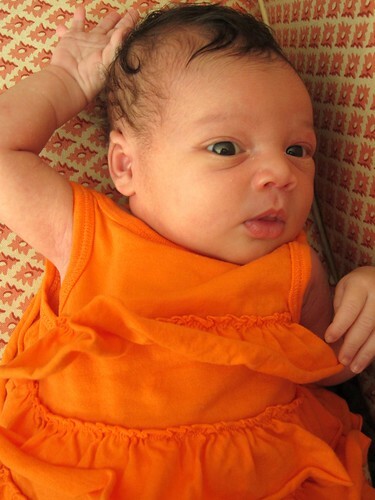 She's looking so cute in that orange. Hope you're getting as much rest as you can! Awww, she's adorable. That dimple, so cute! Congratulations to you. She is just perfect. 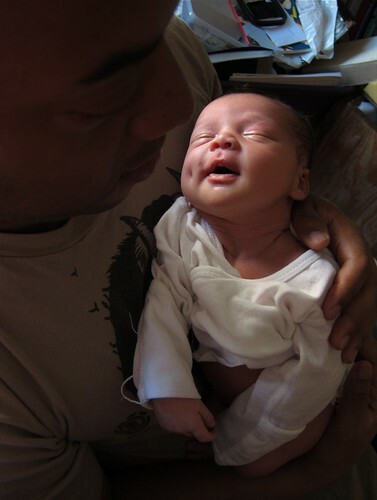 This brings back so many memories--we had our own summer baby 8 years ago and it was magical, in a chaotic sort of way. Thanks for sharing! She is a buttercup, as my mom would say. You're killing me with the cuteness over here! She's adorable, congratulations! Make Your Own Baby Sling!